Joint Opposition Parliamentary Group Leader MP Dinesh Gunawardena was suspended from Parliament for a week due to unruly behaviour yesterday. The motion to suspend the MP was put before the House by Leader of the House and Minister Lakshman Kiriella and it was passed with a majority of 63 votes following a division by name called by NFF Leader Wimal Weerawansa. The motion received 85 votes in favour and 22 votes against. Three abstained from voting, while 114 were absent. The TNA MPs voted for the motion along with the UPFA and UNP MPs in the Government. The Joint Opposition group voted against while the JVP MPs abstained. MP Dinesh Gunawardena walked out of the Chamber following the motion and the JO group followed him making noises to express their objection. Parliament sittings were suspended for three times yesterday and Parliament Police was called into the Chamber for the first time in recent memory. A tense situation erupted in the House soon after Speaker Karu Jayasuriya announced his ruling over the request by NFF Leader Weerawansa to recognize the five members of his Party as an independent group in Parliament. The Joint Opposition (JO) led by MPs Gunawardena and Weerawansa agitated in the House requesting the chair to allow them to express their views over the Speaker’s ruling. The Speaker did not permit this request maintaining that his ruling is the final and that it could not be challenged or debated. The Speaker told the protesting JO MPs that he would allow MP Weerawansa to raise his concerns on a future date possibly within this same week. 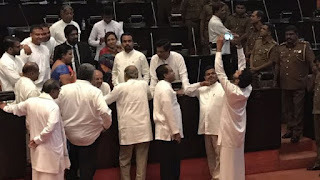 However, MPs Gunawardena and Weerawansa defying the Orders of the Speaker constantly disturbed the proceedings of the House and walked near the mace forcing the Speaker to suspend the sittings abruptly. As Parliament resumed the Speaker urged the members to support him to carry on the day’s business, but the JO did not obey and resorted to criticise the Chair. The Speaker gave back to back warnings to MP Gunawardena not to flout the Standing Orders and not to hurl abuse at the Chair. “I would like to remind you that your criticisms and insults are disrespect not to me personally but to the dignity of the House” he stated. “You are a very senior MP and you should not behave like this. I remember, when you were the Chief Government Whip, you did not even allow me to stand up to move the Right to Information Bill. How can you talk about freedom of speech now?” the seemingly miffed Speaker told MP Gunawardena. “You cannot change the rulings by pressuring and threatening. There is a limit to patience. You are wasting public money. Please allow me to carry on the business of the House or leave” the Speaker told the protesting MPs. The Speaker gave warnings to MP Gunawardena thrice and then ordered him out of the Chamber using the powers vested in him under Standing Order 74 (1) for seriously misbehaving. However, MP Gunawardena did not obey and remained seated and the Speaker suspended the sittings again. As the sittings resumed after about 15 minutes, the Speaker insisted that MP Gunawardena should either go out of the Chamber or allow the business of the House be continued uninterrupted. MP Gunawardena objected to the Speaker asking why he did not call for a Party Leaders’ Meeting to discuss MP Weerawansa’s issue, to which the Speaker said it was discussed at the previous day’s Party Leaders’ Meeting. “You did not speak out about your ruling at that meeting. You cannot keep the ruling inside your pocket and get the Party Leaders to dance to your tune,” he objected. At this point, the Speaker ordered the Serjeant-at-Arms to remove the MP from the Chamber with the assistance of the Parliament Police and then suspended the sittings again. The Joint Opposition MPs numbering about 15 formed a ring around the seat of MP Gunawardena to prevent him being taken Around 2.40 p.m, about 20 Police personnel filed into the Chamber and stood close to MP Gunawardena. The Serjeant-at-Arms and his deputy were seen requesting the MP to move out, but the JO group flatly rejected it. “If you are to use force, then do so. We will not allow you to remove him,” MP Vasudeva Nanayakkara said aloud to the Police. Ministers Dr.Sarath Amunugama and Mahinda Amaraweera were seen approaching MP Gunawardena and talking to resolve the issue. Then after about 30 minutes, the Police withdrew from the Chamber and the House resumed. Minister Rauf Hakeem, rising to a Point of Order, pointed out the Speaker’s order has to be executed as of the conventions in the House, adding that ignoring it would be a humiliation to the House. However, Kiriella pointed out it was not practical as it could even lead to a brawl. Hence, he proceeded to put a motion before the House to suspend MP Gunawardena from Parliament for one week. At the end of the adoption of the motion, Prime Minister Ranil Wickremesinghe commented that the trail of events in the House proved that MP Weerawansa is not functioning independent, but working in coalition with the UPFA in Opposition. Therefore, he questioned the logic of recognising Weerawansa and other MPs of his party as independent MPs.